Angina pectoris is the first stage of coronary artery disease, which is manifested by pain or angina attacks, and precedes the myocardial of heart. Symptoms of angina quite often remind of the myocardial infarction which can last for a long time. To treat this disease used are numerous medications and other medical preparations, we will take this time to base on phytotherapy, which can greatly help in relieving symptoms. The main symptom of angina is certainly a pain behind the breastbone that can range in intensity, from mild to a very strong intense pain. Follows by the feeling of pressure and tightness in the chest, often choking, with the spreads to the left arm, left shoulder or jaw. Sometimes, severe pain can be localized and atypical of place: between the shoulder blades, pain in the shoulders (often the left), in pots or only at the elbow, then going on to take up to ten minutes and usually are accompanied by a sudden jump in blood pressure which after this attack quickly normalizes. 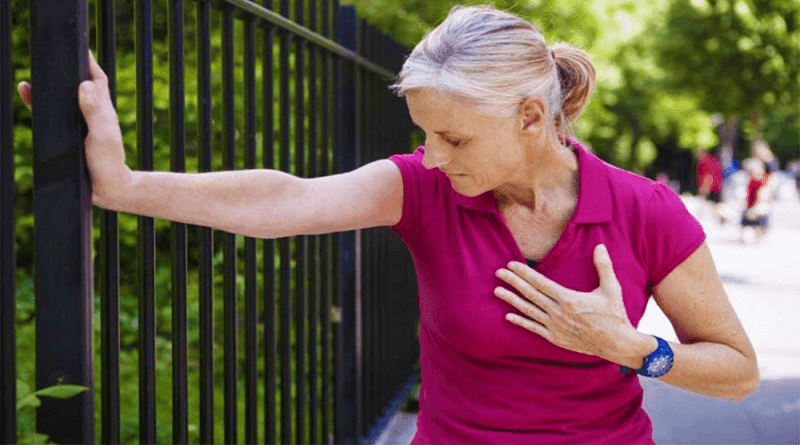 Dull pain in the chest in the case of myocardial infarction is similar with angina attack, but unlike it, it can take longer than 30 minutes, sometimes more than a couple of hours and often is so severe that it is unbearable. Myocardial infarction is often accompanied by abrupt and sudden nausea, sweating and feeling of the lack of air in the lungs. This form of the disease comes after experiencing extreme stress or daily physical exertion. Noticeable angina symptoms-angina attacks last 3-5 minutes, after which they withdraw until they completely not vanish. In patients this type of attack can be provoked by normal daily activities and with minimal physical effort, such as riding a bike or climbing the stairs. In these cases the organism requires greater amounts of oxygen, which then due to the effort does not get to the heart in desired amounts. There is a clear distinction between these two forms of the disease, primarily because unstable angina performances are completely unannounced, angina attacks can occur even while sleeping and when you rest. These symptoms comes mostly due to a significant or even complete blockage of a blood vessels when blood flow all of a sudden stops coming in the required quantities to the heart muscle. If this situation continues, it is likely that patients experience heart attack. Symptoms of unstable angina are much more pronounced than in a stable form: attacks are prolonged and last for at least 15 minutes, sometimes lasting more than 30 minutes, even when all the necessary measures were taken with tranquilizers, such as lying in bed and just resting. This is quite a rare form of the disease and the percentage is present in 2% of all affected. Typical angina symptoms for this form are the contraction in the chest and chest cavity. In many cases people suffering from it are almost completely physically inactive. Medicine for angina is by no means not to be abused and used on your own, but only with the consent of care of cardiologist. Every patient is encouraged to teach their body to recognize these symptoms and difficulties and that in case of occurrence of new symptoms be sure to contact your cardiologist. If stable angina pectoris turns into unstable angina, which is far more severe form of the disease the risk of a heart attack is much higher. Pain and tightness in the chest occur because coronary blood flow is not able to provide the required amount of blood the heart, so that is a so-called myocardial ischemia (poor blood supply). The most common cause of this disease is atherosclerosis, which can lead to narrowing of the diameter (lumen) of the coronary arteries. Regular and sudden jumps in blood pressure lead to a swirling movement of the blood, and the pollutants accumulate faster and accelerate the creation of the narrowing. There is large number of risk factors that are favourable for the occurrence of angina pectoris, and above all these are high blood pressure, high cholesterol and triglyceride blood, diabetes, obesity, stress, lack of exercise and smoking of course, but genetic predisposition should not be ignored. How is manifested - determining the symptoms? How it stops, disappears or reduces? These are the most important issues which help cardiologist provide guidelines for further treatment. Next is medical history that is essential (patient weight, blood sugar, is a smoker, whether there are risks of coronary heart disease such as high blood pressure, high cholesterol, etc.) it is mandatory to perform an ECG heart as well as physical examination. ECG at rest when stable angina pectoris is even in 25-40% of cases shows quite normal results. So for diagnosis work and stress tests (on a treadmill or on a bicycle) helps with the slight increase in the intensity and effort could cause to give subjective and objective signs of myocardial ischemia (insufficient blood supply). In the event that an attack occurs given is 1 -2 lingual nitro-glycerine and is trying to stop the effect of provocative factors. The recommendation is also giving some anxiolytics to the patient to calm the body, and therefore lower heart rate. If there is no nitro-glycerine recommended are calcium antagonists (nifedipine), especially in the case of pain associated with elevated blood pressure. For long-term treatment of disease angina pectoris has an effort to eliminate almost all risk factors: obesity, smoking, and elevated high blood pressure, as well as to achieve good glycaemic control in patients suffering from diabetes. The basis is to treat each diseases such as angina pectoris to be sure to eliminate all the above-mentioned risk factors. Recommendation – Read the article why is glycaemic index important? Problems can be significantly alleviated with the help of medicinal herbs. Here what herbalists recommend. To begin with recommendations these three tea mixtures of heart. Mix equal amounts of lemon balm, hawthorn and mint, and 3 tablespoons of the mixture pour with 7 dl of boiling water and leave it covered to rest for half an hour. Strain and drink one cup three times a day before meals. Mix equal amounts of hawthorn, lavender, and mint, and 4 tablespoons of the mixture pour with 9 dl of boiling water and leave it covered to rest for half an hour. Strain and drink during the day instead of water in sips. Mix equal parts of mint, lavender, lemon balm and hawthorn, and 3 tablespoons of the mixture pour with 7 dl of boiling water and leave it covered to rest for half an hour. Strain and drink one cup three times a day before meals. Mix 5 dl of whey with 3 tablespoons of honey and drink 1/3 mixture 30 minute before breakfast, lunch and dinner. Therapy with whey and honey should be kept for at least 60 days, and the next, which cleans the blood and blood vessels, is an excellent for cleaning the liver. See article whey as a medicine. Pour 20 grams of hawthorn leaves and flowers with 1 dl (96%) of alcohol. Let it stand for 21 days at room temperature. Strain the resulting liquid and take daily about 15 drops along with the water. Take up to 40 drops during the day for 3 week. Best dose is 20 drops taken before lunch and dinner. Natural medicine for angina pectoris is certainly a recipe from nun Hildegard von Binden which is 800 years old, you can read the article wine for heart. When it comes to nutrition for angina pectoris, recommended is that patients take three regular meals a day, with the inevitable drinking of fluids. Eat slowly, chew food well, do not jump over the meals and make sure that each meal takes at least 20 minutes. Angina pectoris requires the kind of discipline in nutrition. We recommend fresh or steamed vegetables, a daily need to eat one fruit of lemon, apple, grapefruit or mandarin. You should eat boiled or fried fish and chicken breast, as soybeans, lentils, beans, azuki beans and tofu. Salty snacks and sweets are strictly prohibited. Consume foods rich in omega-3 and omega-6 fatty acids, preferably that they contain walnut oil, rapeseed, soy and fish meat (sardine, mackerel, herring), as well as oil or grape seed. It is allowed to eat one egg white during the day, and of dairy products drink yogurt and skim milk (2.5 dl per day) as well as cheese from skimmed milk (30-50 grams per day). Eat whole grains and brown rice.